Party on the Plaza (POP) is one of Newman University’s largest fundraisers. 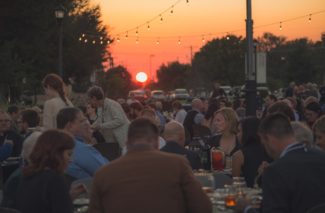 The event was held Saturday, Sept. 22 and brought together the Newman community for a night of great food, fun, a live and silent auction and fellowship. “The event is highly important for student scholarships and the need is greater than ever,” said Senior Development Officer Beth Fatkin. 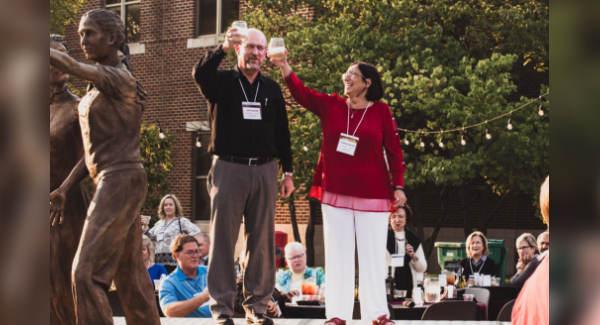 This year, with nearly 450 attendants, the event raised nearly $155,000 in support of student scholarships. Mayor Jeff Longwell was in attendance and helped President Noreen M. Carrocci, Ph.D., start the festivities with an official pop-corking ceremony. On the evening of the event, Fatkin was excited to see six months of hard work come together. “Success would be that we raise a lot of money for student scholarships and that everyone enjoys themselves tonight,” she said. Senior Amy Emerson enjoys helping serve at POP. “I really like POP because it’s an opportunity for me to go out and give thanks to the people who have provided scholarships for me. I get to volunteer with some awesome Newman students and I get a taste of the outside Newman community that we don’t get to see as often on a day-to-day basis here so it’s a lot of fun,” she said. She looks forward to attending next year as an alumna of the university. “It’s nice to see our ties with alumni and that we welcome them back for events like this,” she added.